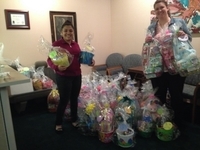 We took 67 Easter baskets to the Crittenton Center. That means that 67 kids who wouldn't have gotten anything for Easter, will! !